Our Full GI Panel consists of our Comprehensive Stool Analysis (CSA) and our Swab Culture. The combination of these two tests provides full coverage screening of all intestinal pathogens and is recommended for anyone experiencing GI symptoms. The CSA provides a detailed analysis of all intestinal parasites (Protozoa, Trematodes,Tapeworms, Nematodes) from all 7 continents as well as other intestinal organisms including Candida, yeast, and other fungi. Analysis of bio-indicators such as red and white blood cells, mucus, fatty acid crystals, starch granules, undigested tissue, beneficial bacteria, epithelial cells, pollen, and charcot-leyden crystals is also included. 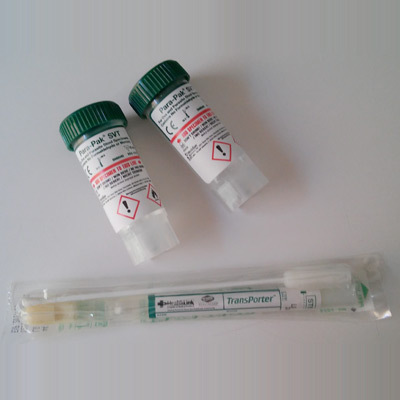 Swabs are taken for culturing and analysis of bacterial and fungal infections. Sensitivity and resistance results as well as quantification of positive findings indicating intensity of infection are also included. The Swab Culture can be used for culturing stool, skin, urine, or any other body parts or secretions, blood can not be cultured. This test is highly recommended for patients with GI symptoms who have had negative stool tests for parasites, as the symptoms for pathogenic bacteria are very similar to those of parasitic infections. Testing package is included. Both the swab and the CSA components of this test must be sent in at the same time or individual prices for the tests will be charged. There are two components to the Full GI Panel; the Comprehensive Stool Analysis and the Swab Culture. The Comprehensive Stool Analysis (CSA) results will be available 3-5 days after receipt of specimens. The Stool Culture results will be available 2-3 weeks after receipt of specimen. We will send out the CSA portion when it is ready and then the full report including the Swab culture findings when they are ready. Understanding Parasites should increase your awareness of the many different types of parasitic diseases. Bio-indicators describes different bio-markers tested for and biological artifacts that are sometimes confused for parasites. Detecting Microbes about microscopic parasites, which cause majority of parasitic infections in the United States. Seasonal Prevalence of Intestinal Parasites in the United States During 2000 Large-scale population investigation and summary.